The House and Senate education committees met this morning in a final push to move bills out of committee for consideration by the their respective bodies before the legislature’s Good Friday break. Below is a summary of those bills related to K-12 education policy. Senate Bill 858 would allow the state education board to exempt from the academic distress classification those schools that exist to serve at-risk students. The bill passed. Senate Bill 878 to require that all students pass the US citizenship civics test as a condition of high school graduation was presented for a second hearing and failed again. Rep. Jana Della Rosa presented HB1539 to allow a parent whose child’s fifth birthday occurs between August 1 and September 1 to petition for the child’s early admission to kindergarten. The bill provided that schools must have space available at the end of the first week of school for an early admission request to be granted. Della Rosa contended that the lack of flexibility in current policy is unfair to those children who are ready for kindergarten at this age, especially since the state allows the transfer to kindergarten of similarly situated children from other states. A spokesperson for AAEA opposed the bill, since schools would be required to admit the child if space is available. The bill failed for lack of a second to the Do Pass motion. Sen. Jimmy Hickey presented HB1779 to allow lottery scholarship recipients who enter college with 27 hours or more of concurrent credit to receive the scholarship amount awarded to sophomores. 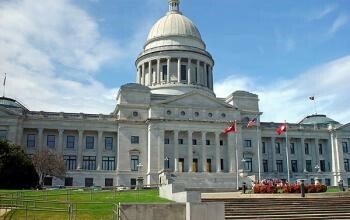 The bill provides that the regulation would take effect in the 2016-17 school year but students entering college in 2015-16 may contact the Arkansas Department of Higher Education to request consideration if the bill becomes law. The bill passed. Sen. Blake Johnson presented HB1583 to broaden the jurisdiction in which school resource officers (SRO) may issue citations or make arrests. Current law limits SROs’ authority when traveling with a school group and any problems must be handled by a nearby law enforcement agency. When a spokesperson for Arkansas Advocates for Children & Families (AACF) opposed the bill because of concerns that SROs’ misuse of authority sends children to the juvenile court system, committee members pointed out that the bill also allows the officers to cite or arrest adults. The bill passed without opposition.